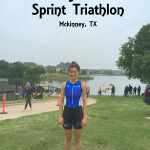 My First Tri. Triathlon. Not Trimester. I only wish!! 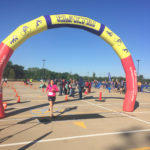 I competed in my first triathlon this morning and even better, I finished!!! That would not have been the case if I didn’t have all the prayers and support!! God was totally me with me throughout the race. It started off with a swim in 66 degree water. There are NO words to explain how cold that is. On top of that, you are starting with 50 other girls and being kicked in the face, while trying not to choke on cold lake water. 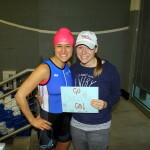 Despite the circumstances, I was the 5th out of 56 girls to complete the swim! But, because of the frigid temperature, I had no feelings in my toes during the WHOLE rest of the race. It made the transition (changing into my bike gear) nearly impossible and didn’t help with the bike or run either. 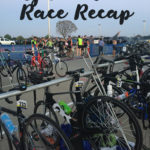 My time for the 500M swim, 11M bike and 5K run was 1:22:07. Everyone I passed (or let’s be honest, passed me) I shouted out “Good Job”, “Keep it going”, “You are doing great”, etc! It made it so much more fun to encourage those around me. When I got home, a friend of a friend texted me to tell me that I placed, “Say whhaaat?”. Apparently I got 3rd place. I was a little bummed we didn’t stick around for the ceremony and to get my plaque, but I had never even thought of that as a possibility! So, I get it now. Everyone told me I would be addicted. I understand why. 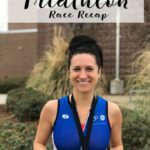 Unfortunately, if my acupuncturist knew that I did a triathlon (especially in the freezing water), she would not be happy! So, I will not be doing one anytime soon, since I’m not supposed to workout too hard or be cold! So for now I will just be crossing it off the bucket list and sticking to my low key workouts! Waiting to get started! Already numb from the cold. The course in the distance. Out to the orange ball, to the right and back around! Getting ready to jump in and tread water! Finishing the swim! Finishing Lap 1 of the bike! 30 seconds after finishing! Swim. Bike. Run. Check With my #1 Support! Girl, that’s freaking CRAZY!!!! Any water below a solid 85 is just too cold to consider… Even when I use to swim I never swam in the 60’s… that’s crazy! 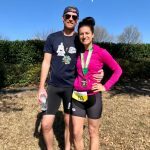 And congratulations on a triathlon! That’s awesome… just to finish, let alone to place! you my friend, are a rock star. Love. 3rd place?!?! Amazing! Congratulations! 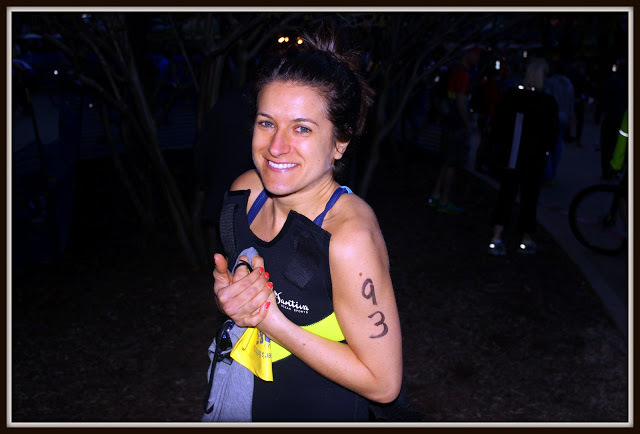 Also, you look GREAT after just finishing a triathlon! CONGRATS!!! You are a rock star!!! Congratulations! I am totally impressed. Way to go!! You go girl! How exciting! What an accomplishment. And on another note, I can’t help but be distracted by those houses (castles???) by the lake. Whoa. Congratulations!!! And may I just say that you look adorable in the after pictures! I am always a hot mess after ANY workout, much less any type of race or anything!